President Trump has been in power for just over a year and has enjoyed few policy successes. But one area where his administration’s radical, deregulatory agenda has been successful is in dismantling environmental protections. 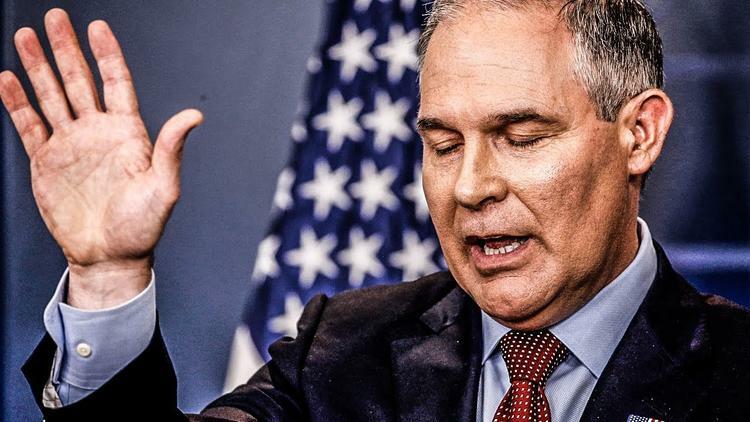 The Trump administration has not quite fulfilled a campaign promise to abolish the Environmental Protection Administration (EPA), but it has made changes that have weakened it and that will have long-term consequences. The administration says it is on course to cut staff levels at the EPA by 50% by the end of Trump’s first term. The EPA now has fewer staff than at any time since 1988. In 2017, the administration requested a US$2.6 billion (17 billion yuan) cut to the EPA’s budget, saying they wanted to end 50 department programmes. After Congress intervened, a much smaller US$81 million (520 million yuan) reduction was achieved. n 2018, the EPA budget will shrink again. Huge areas of formerly protected national parks and coastline have been opened for oil, gas and mining, in pursuit of what the administration calls “Energy Dominance”. These beautiful landscapes will be changed forever if they fall into private hands. The Department of Interior plans to shrink Bears Ears and Grand Staircase-Escalante national monuments in Utah by more than half, putting almost two million acres of protected land in private hands. The decision was strongly opposed by both environmentalists and indigenous groups. The area is a site of cultural significance, hosting ancient artefacts and sacred burial grounds. Efforts to combat climate change are anathema to an administration entranced by fossil fuels. It has proposed to repeal and replace the Clean Power Plan, President Obama’s key climate policy. Important posts across the government have been staffed by people who downplay the importance of climate change. Many government websites have been scrubbed of words like climate change, and EPA administrator Scott Pruitt has publicly stated his desire for a “red team-blue team exercise”, where established climate change science would be scrutinised by people with questionable scientific credentials. Christine Todd Whitman, who ran the EPA between 2001 and 2003 under President George W Bush – and who was no environmentalist – called the idea “a shameful attempt to confuse the public into accepting the false premise that there is no need to regulate fossil fuels”. Industry interests, particularly the fossil fuel industry, are shaping Scott Pruitt’s agenda. According to a study by the Center for Public Integrity, of eight top priorities in a “wish list” sent to the EPA by the American Petroleum Institute (API), six have already been achieved, including suspending efforts to reduce methane, a powerful greenhouse gas. Much of this agenda has been pursued in private, away from public scrutiny and oversight. Pruitt went so far as to instal a special soundproof communications booth in his office and upped his personal security. Taken together, this may amount to a real-world example of the “deconstruction of the Administrative State”, championed by disgraced former Presidential advisor Steve Bannon. But people are fighting back. The public has been overwhelmingly against the Trump administration’s plans. The government received more than 2.4 million public comments on plans to change national monuments, almost all opposed. Elected officials, including some Republicans, are also fighting back. A proposal to open up coastal waters for offshore drilling met fierce resistance. Interior Secretary Ryan Zinke was forced into an embarrassing climb-down by Florida Governor Rick Scott, a Republican, who expressed concerns that expansion of drilling might negatively impact Florida’s tourism industry. This month, an effort to subsidise coal and nuclear energy was also overruled by the Federal Energy Regulatory Commission (FERC), which is chaired by a Trump administration appointee. Expect to see more resistance in 2018. Most of the coastal states affected by the expansion of offshore drilling oppose it. The precedent set by granting Florida an exemption guarantees further legal challenges. In fact, most of the administration’s actions are being challenged in the courts. But the sheer number of changes being made to environmental protections may overwhelm efforts to fight back. Before too long the changes are likely to have real world effects. Both water contamination in Flint Michigan and the Deepwater Horizon disaster, which killed 11 people and leaked 3.19 million barrels of oil into the Gulf of Mexico, happened under President Obama, who’s administration had comparatively strong environmental protections. As the Trump administration deregulates, further destructive and expensive incidents seem inevitable. This work is under Creative Commons’ Attribution-NonCommercial-NoDerivs 2.0 England & Wales License and 2.5 China License.